Back in August, I read an article posted by SAKER in connection with a book publicised by Alex Krainer. In his book, Alex Krainer deconstructs and critises the book publised by Bill browder famous from the "Magnitsky Act" and well known enemy of President Putin. 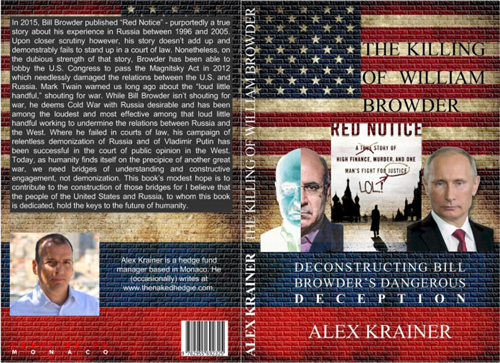 "The Saker" wrote: Today I want to introduce you to a book whose importance simply cannot be overstated: The Killing of William Browder: Deconstructing Bill Browder’s Dangerous Deception by Alex Krainer. I consider that book as a *must read* for any person trying to understand modern Russia and where the new Cold War with Russia came from. Most of you must have heard of the Magnitsky Act or even maybe of William Browder himself. You probably know that Browder was a British businessman who founded Hermitage Capital Management investment fund which Sergei Magnitsky represented as a lawyer and auditor. Finally, you must have heard that Magnitsky died (was killed) in a Russian jail while Browder was placed by the Russian government on a black list and denied entry. For the vast majority of you, that is probably as much thought as you ever gave this topic and I have to confess that this is also true for me. I never bothered really researching this issue because I knew the context so well that this, by itself, gave me a quasi-certitude that I knew what had happened. Still, when I read this book I was amazed at the fantastically detailed account Krainer provides to what is really an amazing story. In his book Alex Krainer offers us the truth and truly shows us how deep the rabbit hole goes. Interestingly, Krainer himself admits that he was initially rather suspicious of Putin and very sympathetic to Bill Browder. 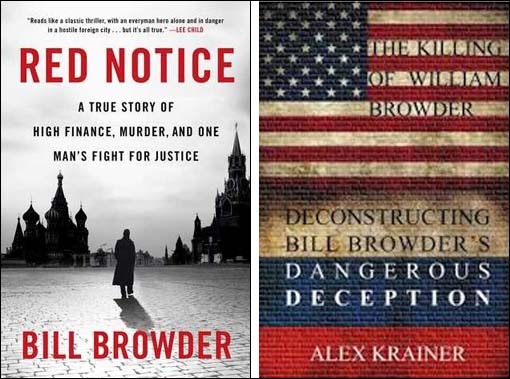 Paradoxically, it is Bill Browder’s book, Red Notice: A True Story of High Finance, Murder, and One Man’s Fight for Justice, which triggered Krainer’s internal alarms and which made him dig deep into this story. I won’t give you all the details here, Kainer does it better then I ever could, and you really need to get a copy of his book. I will just say here that the book begins by a meticulous and sophisticated debunking, piece by piece, not only of all the lies contained in Browder’s book, but also of the sophisticated propaganda techniques used by Browder to demonize Putin, Russia and the Russian people. Far from being this person who “believes in Russia”, Krainer shows that Browder is a hate-filled racist bigot whose hate for everything Russian is as visceral as it is ever present. Next, Krainer provides a most needed and extremely detailed presentation of what he calls “the missing context”, that is the vicious plundering of Russia by Russian oligarchs and Western financiers during the 1990s. As somebody who lived through these years I can attest that Krainer’s description is accurate. His only mistake is when he indicates that while the official figure of people killed in the 1993 is only 187 killed, the real figure “Unofficial figures might have been as many as ten times higher”. A well-informed and high-placed source of mine in the Russian special forces told me that the internal government estimates (no real tally was ever made, nor was it possible to make one anyway) placed the real number of people killed for the Moscow region in the course of the week following the crackdown at no less than 5’000 for the Moscow region. But other than that, Krainer is spot on. Having provided the context, Krainer goes on to explain what Vladimir Putin did once he came to power. This section is also crucial because it shows the real causes of the hatred Browder and his likes have for Putin: the man basically made them lose their grip and Russia. "In 2015, Bill Browder published “Red Notice” – purportedly a true story about his experience in Russia between 1996 and 2005. Upon closer scrutiny however, his story doesn’t add up and demonstrably fails to stand up in a court of law. Nonetheless, on the dubious strength of that story, Browder has been able to lobby the U.S. Congress to pass the Magnitsky Act in 2012 which needlessly damaged the relations between the U.S. and Russia. Mark Twain warned us long ago about the “loud little handful,” shouting for war. Bill Browder has been one of the loudest and most effective among that loud little handful clamoring for a new Cold War with Russia. Where he failed in courts of law, his campaign of relentless demonization of Russia and of Vladimir Putin has been successful in the court of public opinion in the West. As humanity finds itself on the precipice of yet another great war, what we need are bridges of mutual understanding and constructive engagement, not demonization. This book’s modest hope is to contribute to the construction of those bridges for I believe that the people of the United States and Russia, to whom this book is dedicated, hold the keys to the future of humanity." On the 17 October 2017 Russian Insider published an updated version of Saker's article. It appears that AMAZON has de-listed the Book by Alex Krainer. Enjoy reading the Book..... I did....and waiting for a copy that I bought on Ebay.